In 2004 Walt Disney Studios announced that they were would no longer be making traditional, hand-drawn films. This was down to their last few hand-drawn films not being huge financial hits. A lot of those films weren't even critical hits either. In the five years that followed Disney focused on live-action, their Pixar films, and their own computer-animated films. However - since their computer-animated films Chicken Little, Meet the Robinsons and Bolt didn't exactly set the world alight - Disney decided to return to their roots. They would make a hand-drawn, musical film based on a Brothers Grimm fairytale - The Princess and the Frog. They would also get Ron Clements and John Musker to direct this film. This duo directed The Great Mouse Detective, The Little Mermaid and Aladdin. 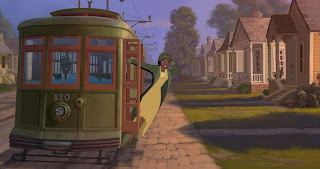 The Princess and the Frog is about a young woman called Tiana who lives in 1920s' New Orleans. Tiana grew up with her father telling her about his dream of opening up a restaurant. Tiana shares her father's dream and passion for cooking. When her father dies she wants to make the dream come true for both of them. Tiana, now an adult, is working two jobs to save up as much money as she can to buy a restaurant. Whilst this is going on, Prince Naveen from the far-off land Maldonia arrives into the city. Naveen's parents have disinherited him due to his party-animal ways and now he's looking for a rich wife to support him. Naveen then meets a mysterious man called Dr Facilier who turns out to be a voodoo-practising "shadow man". Facilier tricks Naveen by turning him into a frog. Facilier then gives Naveen's servant the appearance of Naveen so the servant can work for him and help him take over New Orleans. At a fancy-dress party Frog Naveen mistakes Tiana for a princess and asks her to kiss him in the hope that he'll get turned back into a prince again. Tiana agrees when Naveen tells her that he'll cough up the rest of the cash needed for Tiana to get her restaurant started. 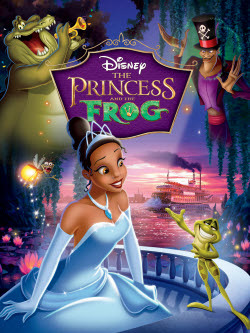 But it turns out that since Tiana isn't a real princess she gets turned into a frog as well. The rest of the film has the two of them trying to break the curse and stop the evil Facilier. The Princess and the Frog is a great film and a really nice, clever update of the fairytale. Whilst it doesn't hit the heights of Disney's best films from the 1990s it's still a big step in the right direction! I really enjoy this film. The animation is gorgeous. The film has a very old-fashioned, traditional Disney feel. I love the setting. 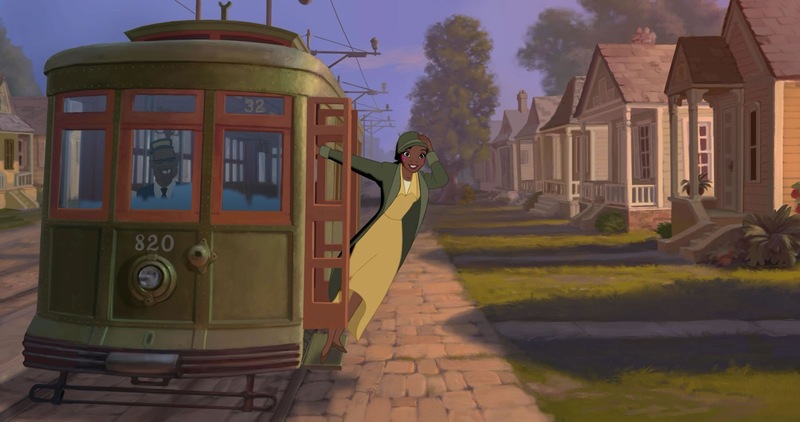 What better city to set The Princess and the Frog than New Orleans, a city that's surrounded by swamps?! The film has great characters too. Tiana made history as being Disney's first African-American heroine and she's a brilliant character. She's really engaging and is easily the best Disney heroine since Mulan. She's bright, she's optimistic, she's full of energy, and she's ambitious and driven. She's a great role model. Naveen is arrogant and lazy to start off with but he's quite good fun and a good foil to Tiana. She teaches him about the importance of responsibility and working hard and he teaches her that it's OK to lighten up and have fun. There are a lot of memorable, comic sidekicks in this film as well. Tiana's best friend Charlotte is really funny. She's pretty ditsy but she's very sweet and I loved that they didn't make her two-faced and bitchy. There are animal sidekicks in this film too! We get an alligator who wants to be a jazz musician and a Cajun-accented firefly who's in love with a star in the sky. The villain is great too. He's brilliantly-voiced by Keith David and is scary, charming and sinister. 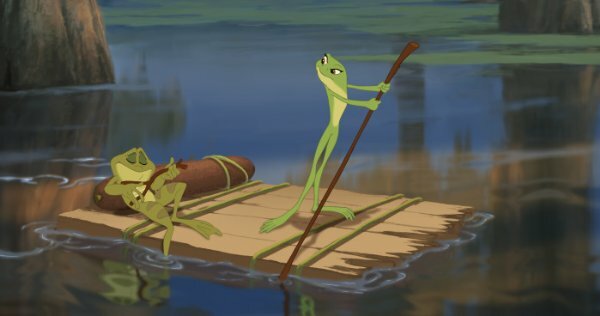 The Princess and the Frog is still a great film though and it seems to have kickstarted a new Disney Renaissance. Since this film we've had Tangled, Winnie the Pooh and Wreck-It Ralph. I still haven't seen Winnie the Pooh and Wreck-It Ralph yet but I know they were very well-received. I've seen Tangled though and that film is awesome!